I just want to say–Vegas was incredible as usual! It was great catching up with some of my friends and hearing what’s been happening at home since I left a little over three months ago. 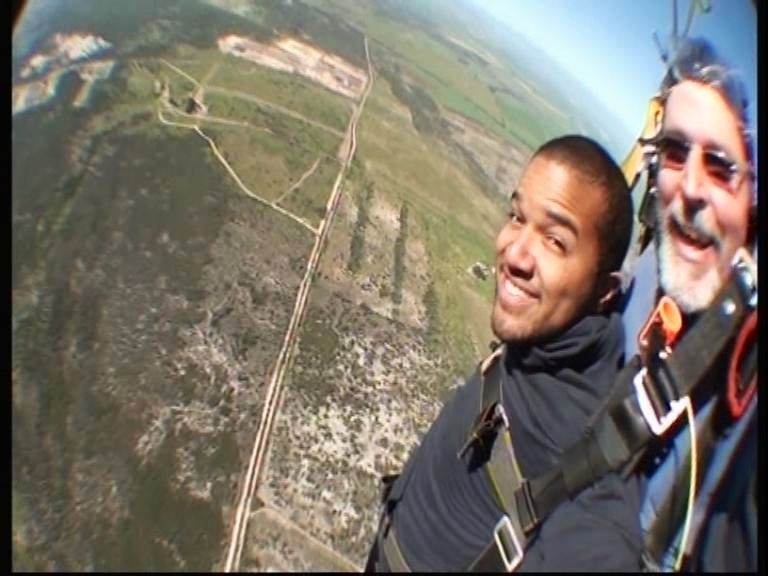 I also got the chance to skydive again and it was just as amazing as my first time in South Africa! 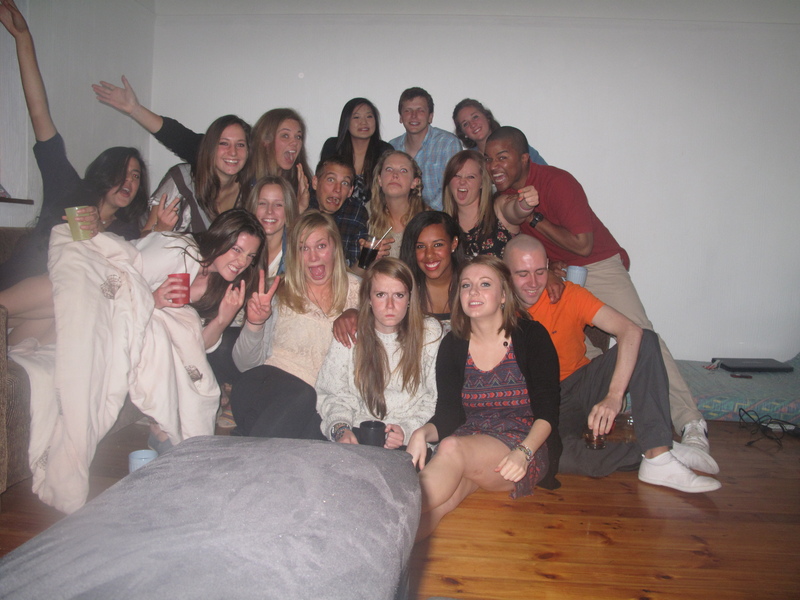 Speaking of Africa, I found myself constantly thinking about one of the greatest summers I have ever had. Matt, Bryan, and the others would ask me about my trip, but I had a hard time figuring out where to begin telling them; I have done and experienced so much! I’ve been home in Michigan for a day or two now and everyone is interested about what I’ve been up to and what interesting stories I have. A lot of them kept up with me on this blog, which I was really, really glad to hear. Those times of searching aimlessly for decent internet in the middle of Africa paid off. You guys have no idea just how tedious that was. It wasn’t just internet I had to find, I had to find a place with connectable wi-fi. I wrote my blogs on my iPad, connected that to a wi-fi hotspot to upload to this WordPress site, and then from a computer I could place photos and finally publish a post for all of you to see. This explains those long gaps between publishing certain posts; it’s not because I was lazy and didn’t write anything, it’s because I had no access to the internet. I had friends say I looked humbled and completely refreshed when I saw them again. 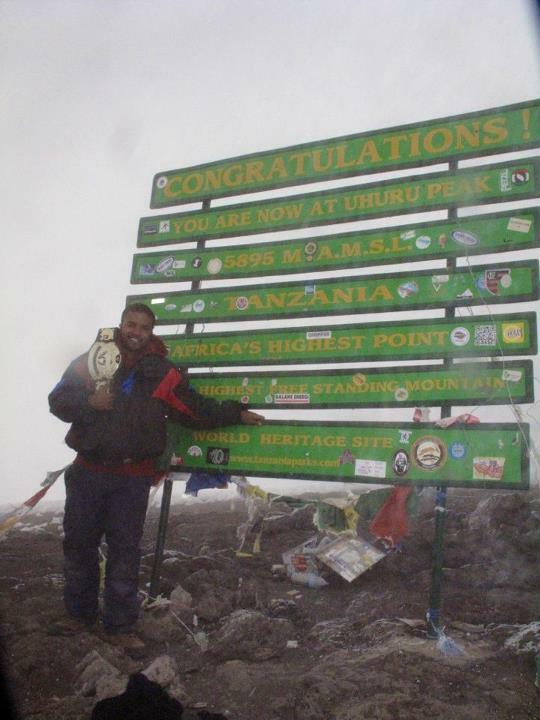 That could be true because I was in complete bliss my entire time in Africa (even on summit day on Mount Kilimanjaro). I’ve done just about everything I wanted to do although the stuff I missed I’ll save for my return one day. However I won’t get to ride an ostrich, I weigh 15k too much haha! I do miss all the fantastic people I have met over the last few months; my Rec 13 (and Palmer) house, my Old house (and New house), my safari squadron, my LX6 Kilimanjaro family, the SASTS volunteers, my Zanzibar rafikis, the Zulu family, and some of the locals I met in SA and Tanzania, and especially all of the kids I had the pleasure to teach and spend time with. 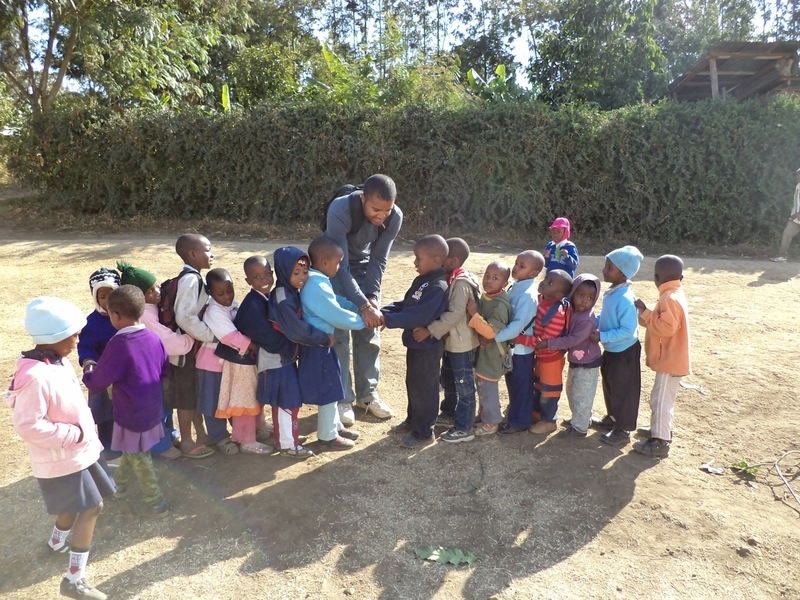 The kids in Muizenberg and Arusha were some of the happiest children I have ever met, even under their subpar living circumstances. 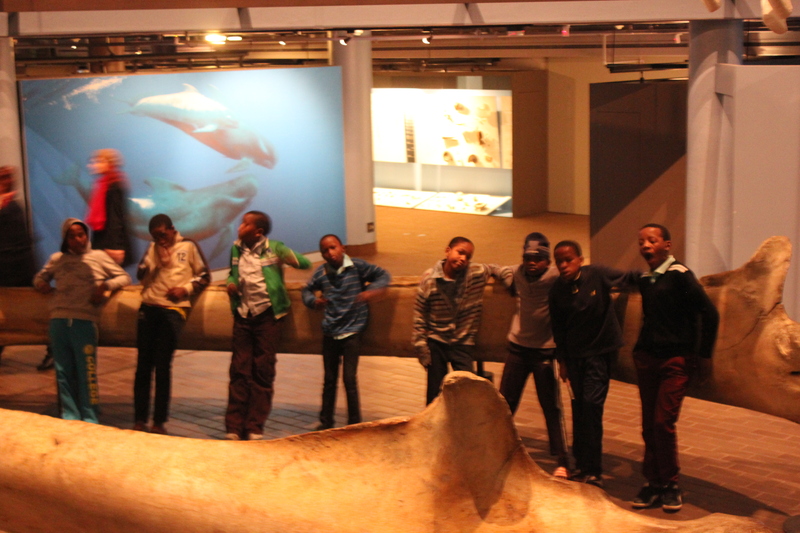 And then there’s the kids of Kayamandi, specifically Aphiwe, Fudo, Atha, RiRi, Ski, Chester, Avele, and Mawande–I miss those guys more than I care to admit. I wonder what they’re up to right now? 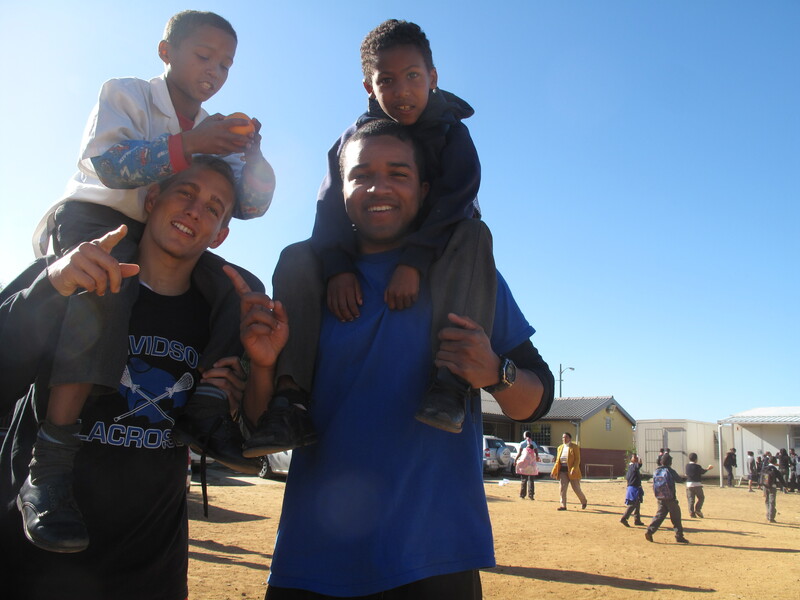 I’m glad I was able to share what I experienced in Africa with you all. A lot of my friends and family never really understood exactly what I do when I travel and volunteer in other countries. Now, as you can see, I have the most absolute best time of my life! My main focus in writing this blog was to inspire everyone and show off what else is out there on this humongous planet, from the perspective of an average guy such as myself. I received lots of e-mails from strangers who read this blog asking me a bunch of questions because they want to do the things that I did too. Flattering. I am completely open to answering any questions or giving any advice with anything pertaining to any of my posts. So keep tabs on me you guys. 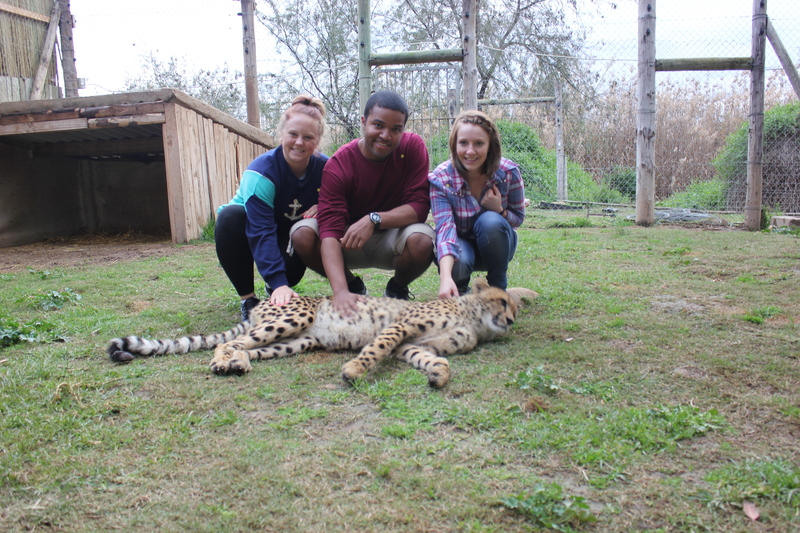 My stint in Africa may be done for now, but I am already in the beginning stages of planning another big trip abroad. I don’t know where (Southeast Asia? ), I don’t know when (maybe next summer?) but it WILL happen soon. Also this time, maybe I won’t go alone? Maybe I can tempt a friend or two or three to come along, now that they’ve seen what I have done. I can’t see myself stopping anytime soon, it’s my drug. And of course, I will be sure to blog about it again. This isn’t the end my friends, it’s just where I begin again. Until next time, be safe folks and happy travels! Here’s a little something extra for you guys, check it out! 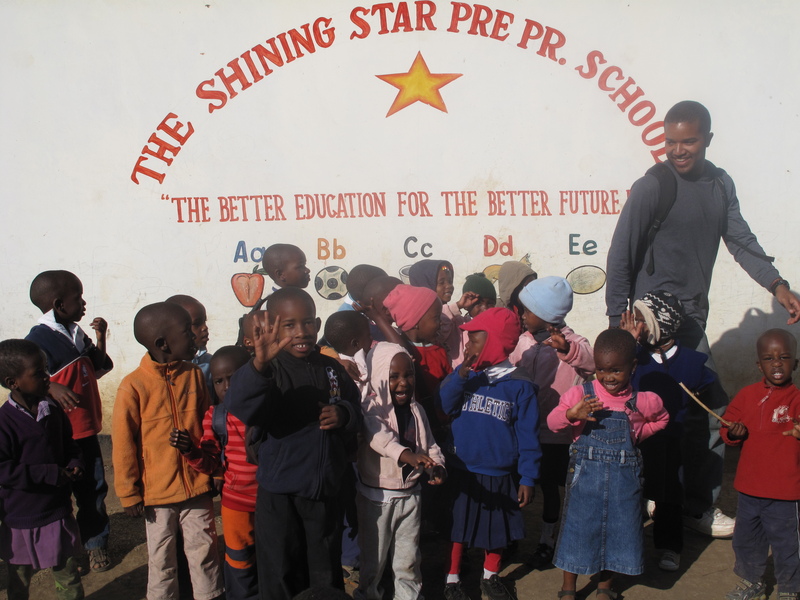 I was the only volunteer left at the Shining Star Pre-primary school. Ari had already left about a week ago and volunteers from the different organizations had gone already too. I was welcomed back with open arms by the kids and teachers. I told the principal that I only had two more days after this at the school. I didn’t want to leave them without knowing they had enough supplies to last them for a while so I asked the principle if there is anything they are in desperate need of. Books? Pencils? Paper? It turns out a lot more than I thought. She wrote down a list of things they needed that I could get for them if it was possible. My whole time here at this school, they never asked me for a thing, so I was happy to help them out. I wanted to get as much as possible so I went into town later that afternoon and bought 200,000 shillings worth of supplies from a local stationery store. 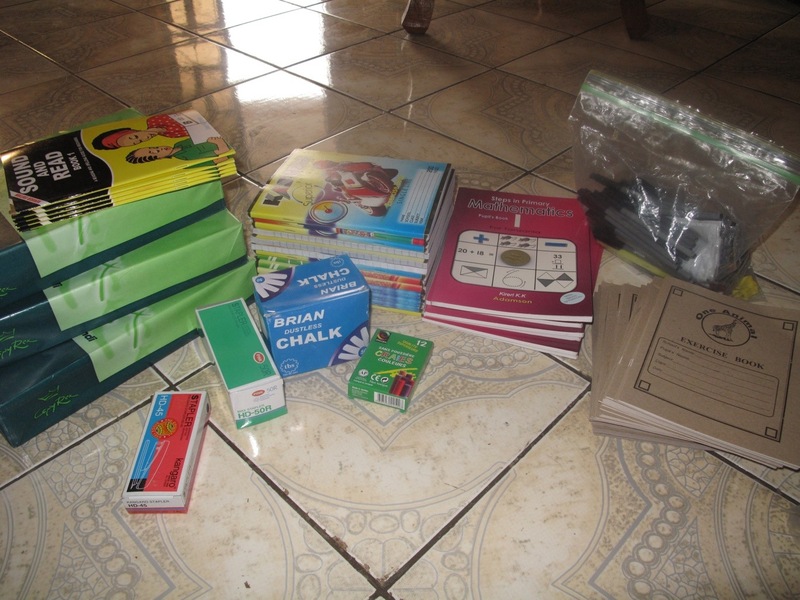 New notebooks for every student, math books, phonics books, tons of pens and pencils, colored chalk, staplers, packs of paper, pencil sharpeners, erasers, and more notebooks to last each student for a year. On top of that, I paid one months rent for the building the school uses. That was about another 100,000 shillings. It was the least I could do. 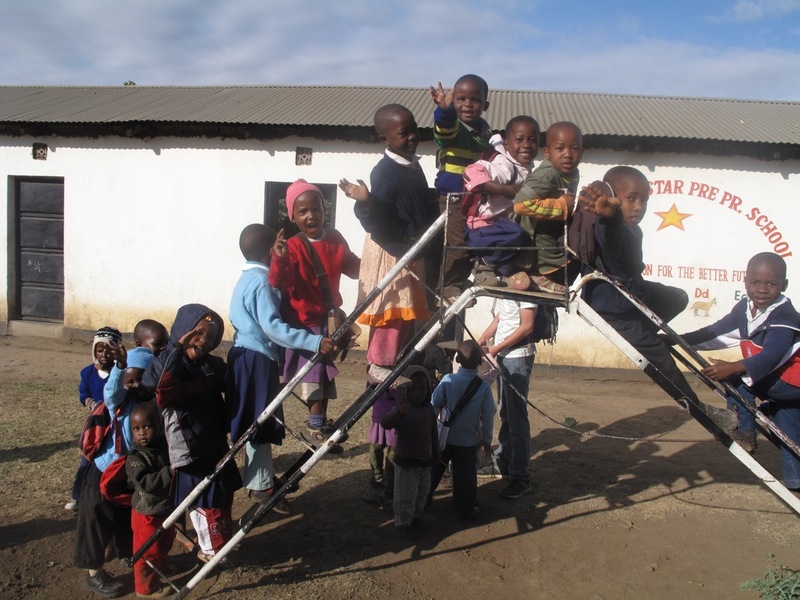 This school has next to nothing and needed all the help they could get. The teachers appreciated my gesture and gave me a special going away day on my last day there. They gave me a card, took a bunch of pictures with me, and the kids sang to me. This should last them quite awhile I hope! The learners of Shining Star! It was my favorite day at the school for sure. I played with the kids all morning and afternoon long. It was a bit hard to say goodbye because there’s still so much I wanted to teach them. Like how to do simple addition and subtraction without drawing circles every single time they attempted a math problem. One more tug-of-war for the road. I gave word to the coordinators of my organization that Shining Star needed more volunteers and all the help they can get. Nelly, one of the coordinators, said that they will send a lot more volunteers the next chance they get. 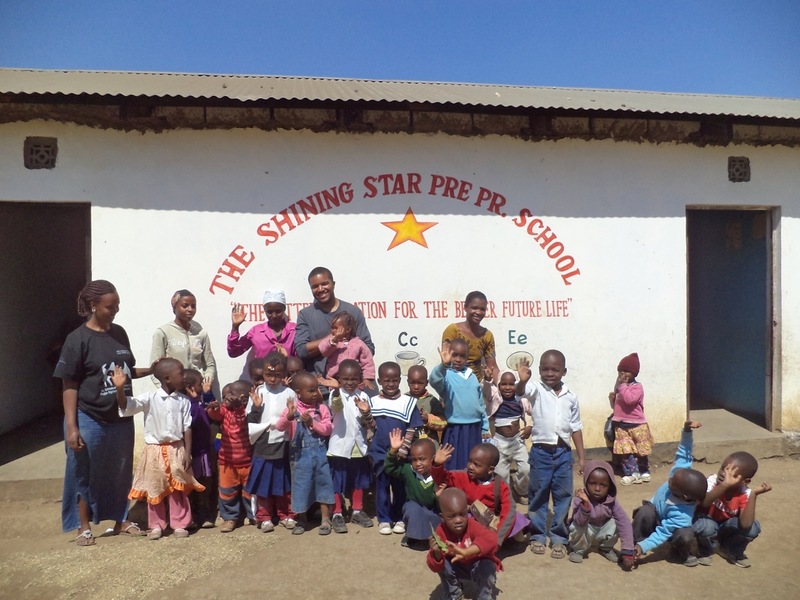 That’s good news because with each volunteer Shining Star gets, means more money donated to the school. During one of my final nights, I gave in and got a Masai burn on my right arm. Tradition goes something like this; when boys in a Masai village hit puberty, they are given a ceremony for circumcision. During the ceremony, the boy is given a Masai burn on both of his cheeks, right underneath the eyes. A burn is a circle about the size of a nickel and it signifies when that boy has become a man. This is the part that’s crazy. After the ceremony, the boy is banished into a jungle somewhere in the country and must fend for himself for three months to prove that he is worthy to be called a true Masai man. If he got any help from the outside world in any way, then he will become exiled from the tribe. But if he manages to survive, them he must return to his village with a new cow as a gift to his parents. And by then, the burns on his face will have become scars which signifies that he is now truly a full-fledged man. Crazy huh? I didn’t make any of it up. Stuff like that actually still happens in this world! I chose to forgo the three-month in the jungle part and asked our security guard, Thomas who is a Masai, to burn me in the arm. He happily agreed. 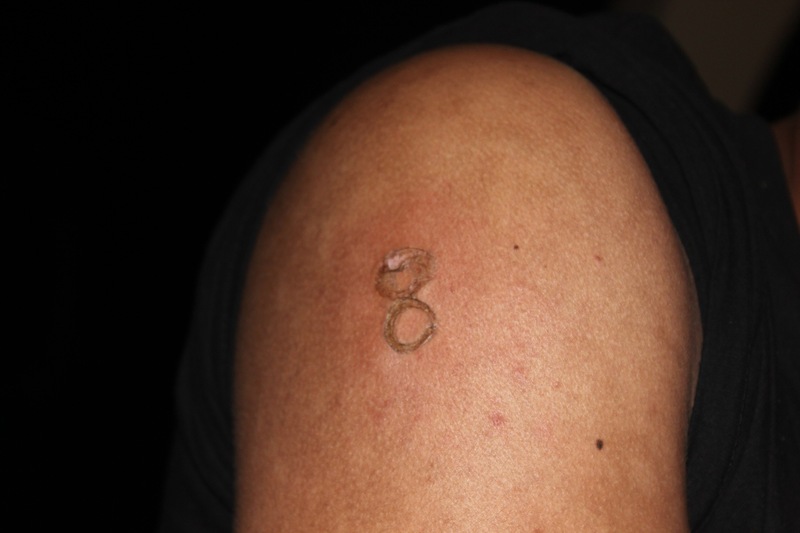 Instead of one burn, I got two burns in the shape of a figure-eight. I saw a figure-eight on some Masai men I have seen before and decided that is what I wanted. Call me crazy if you want. From boy to man. Burned! It’s semi-permanent. It starts as a nasty looking scab for a couple of weeks and will eventually fade into a scar. After about ten years, you will barely notice the scar is still there. I wasn’t the only one to get a burn. A handful of others at my house got a burn on either their foot, their arm, or the back of their neck. 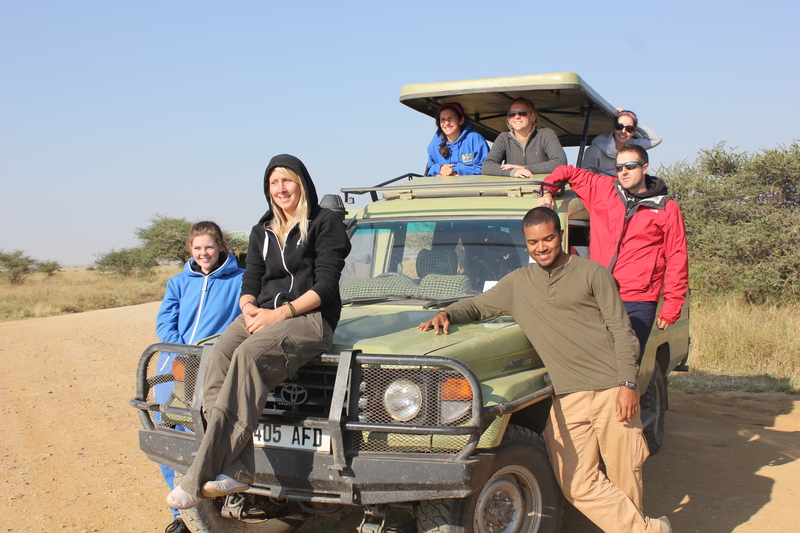 It will have a cool story behind it and it will be something to remind me of the amazing experiences I had in Tanzania. It doesn’t look too fascinating now but by the time I get home, it should be scarred over. I’ll show you guys it later! 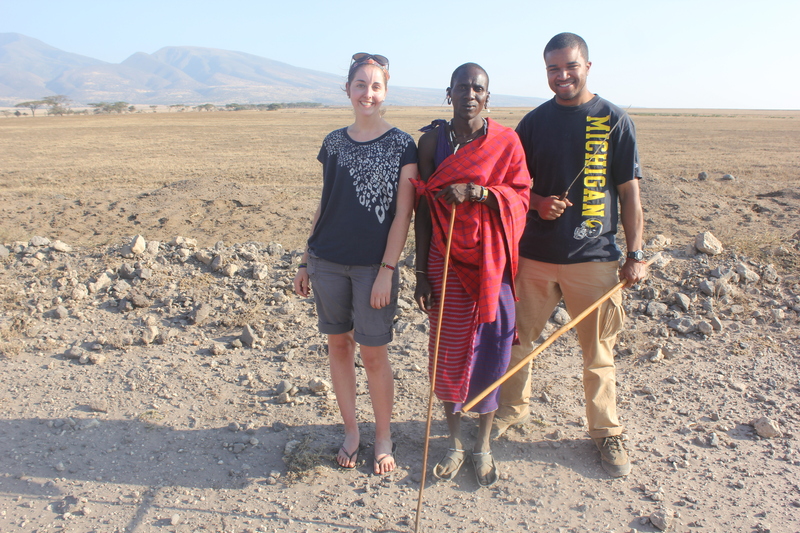 I spent five weeks here in Tanzania and I didn’t buy any souvenirs or gifts for home! My friend Godfrey, who lives in the nearby town of Moshi, wanted to hangout on my last afternoon here. So I figured we can grab some food and go to the Masai market to barter for gifts. Godfrey is a local who found me via Facebook. He’s part of the IVHQ Tanzania Facebook Group and noticed that I was coming to Tanzania at this time. He messaged me saying he wanted to meet people from around the world and said he could take me and other volunteers around the cities. I’ll admit, at first I was a little hesitant in meeting some random guy in a foreign country but he seemed nice though and I met up with him in town. 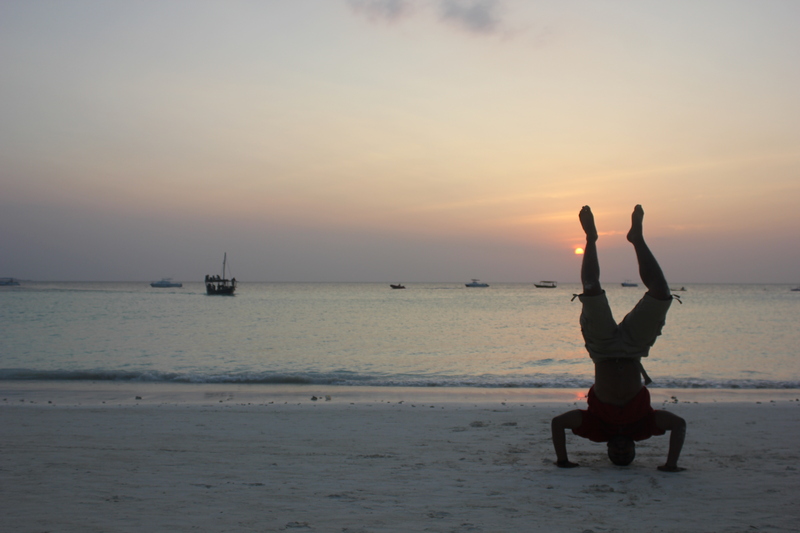 He is a college student and teaches Swahili to English speakers as a side job. He’s actually really bright and it was a nice change having an actual local not affiliated with IVHQ showing me around town. 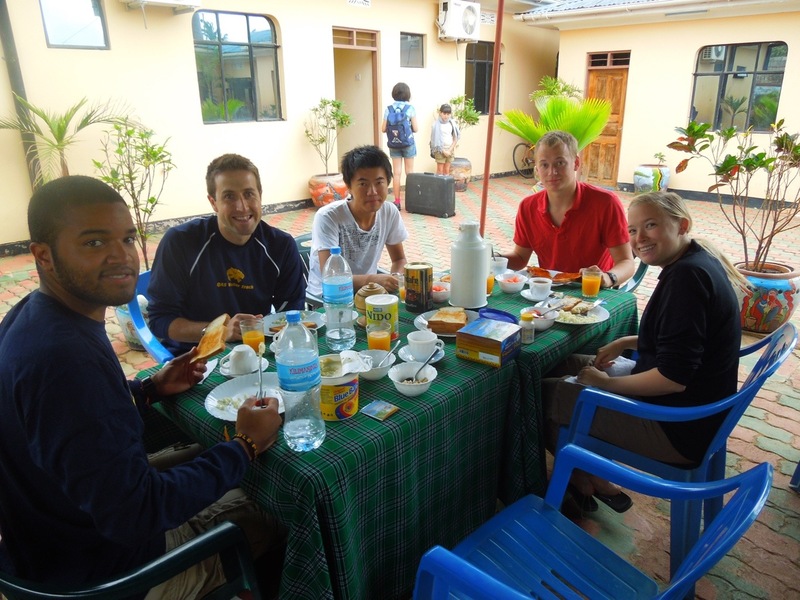 Over my stay in Tanzania, we hung out in town a few times with other volunteers. 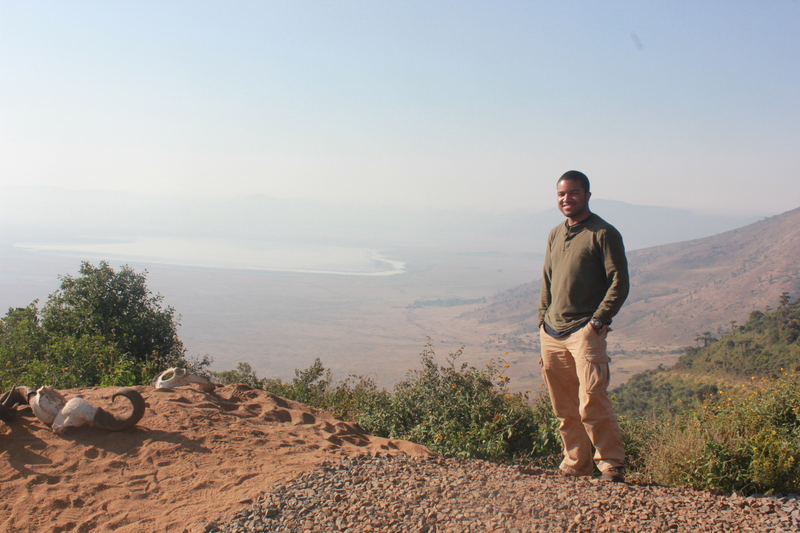 He’s a student who longs for a connection to the world outside of Tanzania. I can’t blame him for that. He’s never been out of the country. Tanzania is one of the poorest places in Africa so it’s not surprising to know that most people here have never stepped foot outside of it. He wants to go to America one day. I told him that when he does, he’ll have a place to stay in Michigan and I would show him around. As a gift, he gave me a chunk of unfurnished Tanzanite. It was an awesome gift because you can only get Tanzanite in Tanzania and it is expensive everywhere else in the world. I’ll have to figure out how to grind it into a jewel when I get home. Thanks Godfrey! 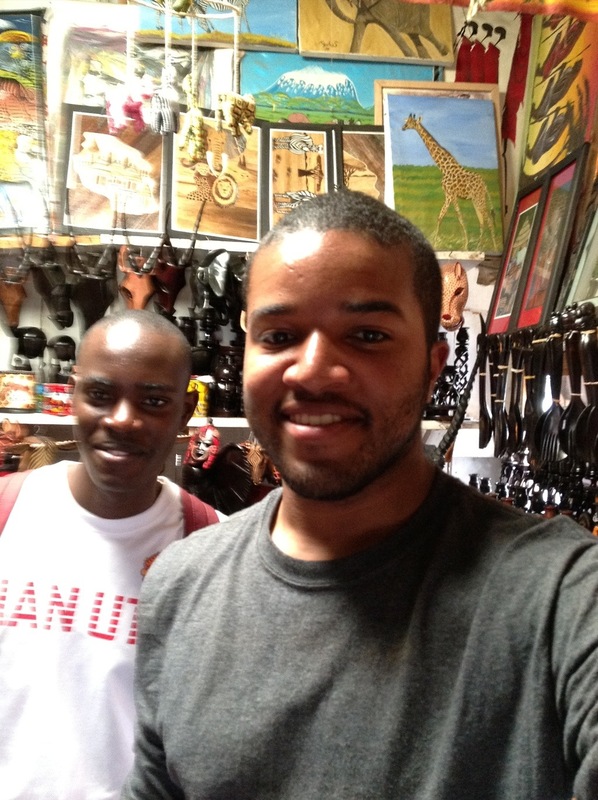 Godfrey and I at the Masai market. One of the shop owners was playing with my iPad and took a picture of us. Later on, I packed my bags and said my goodbyes to my housemates. Most of the housemates I have grown close to have already left the house before me, so the house was full of a bunch of people I barely knew. 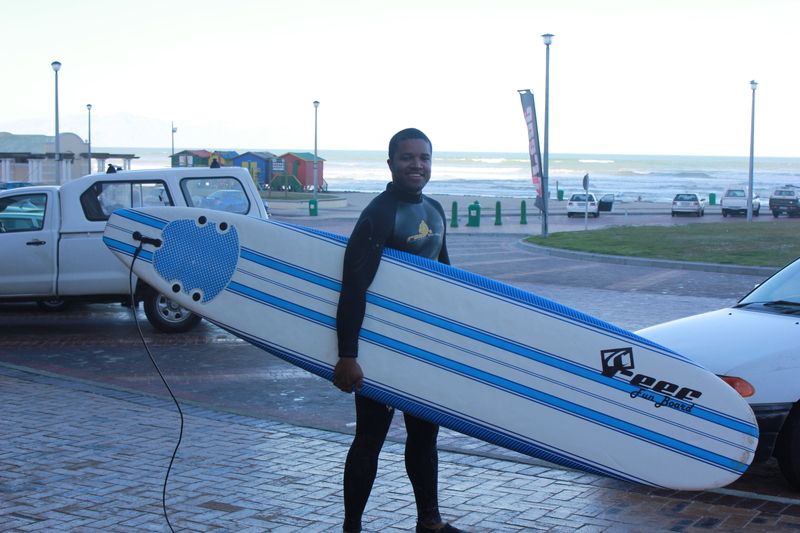 Needless to say, goodbyes weren’t as difficult here as it was in Muizenberg. But there were still some people left who have been here for a long time that I became friends with, which I had to leave. I had to go to the Dar es Salaam airport later. 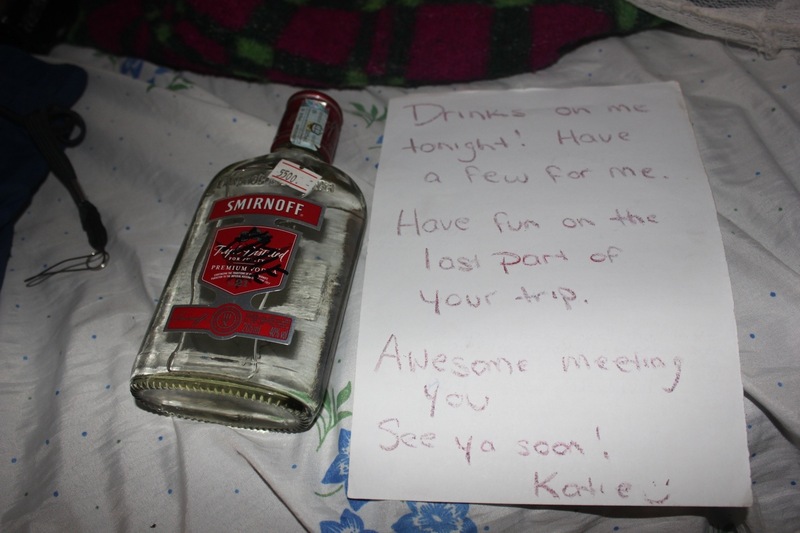 Katie left this for me before she departed. Zara (Manchester, UK), Josh (Manchester, UK), Anne (Denmark), and I took an eleven hour shuttle to Dar es Salaam. After a long haul, we made it and I helped them get a room at a nearby hotel. The four of us enjoyed one last dinner in Tanzania at a restaurant on top of the hotel. It took an hour and twenty minutes to get our food but hey, this is Africa! That was expected. Later on that night I said my goodbyes to the three, as I would be separating from them. They were staying overnight to go to Zanzibar the next morning. I had a plane to catch in a few hours to go back to Cape Town. I’ve said goodbye to so many awesome people in Africa so many times over the past couple of months; I’ll tell you, it’s never easy. You’re part of a group of people with common interests, experiencing a strange world together for the first time. With that, we all grow closer a little faster than it would be at home. I know I’ll never see most of these people ever again. It’s bittersweet but I’m ready to get back to Cape Town. There’s a McDonald’s there waiting for my return :). I can’t end this post without ranting about my beloved African Airports. Ah yes, African airports. They are the most organized, friendliest, smooth sailing airports in the world. None of what I just said is true. Harking back on the sloppy mess that was the Johannesburg airport, I had low expectations for the Dar es Salaam airport. I prepared myself for this one. I arrived six hours early to give myself the time I needed to fix any inevitable confusion. Everything went smooth at the start. I was actually able to sleep for a couple of hours as I waited for the South African airline desk to open. Prior to checking in, I wanted to see if my baggage weighed under 50 lbs. I opened my luggage and checked to see what I could do to lighten the load by 5 lbs. 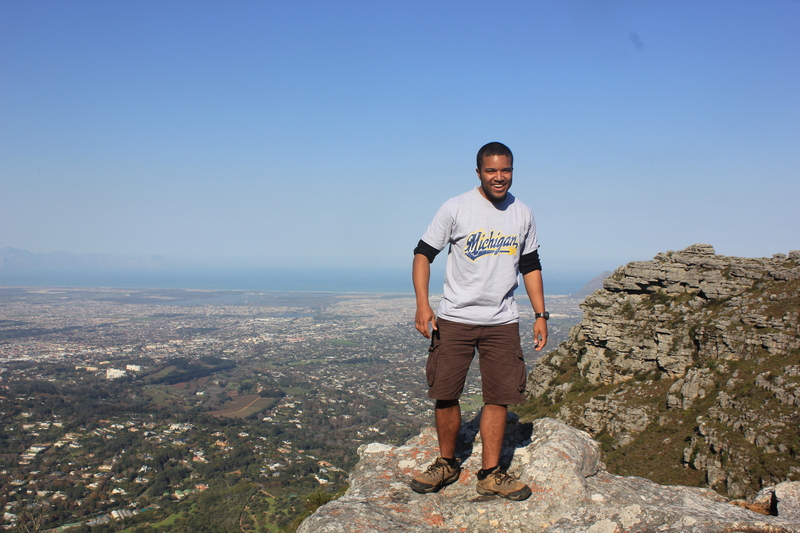 I put on a few shirts and switched my sneakers for hiking boots which were a tad heavier. I also put a book into my carry-on luggage which is already pretty stuffed. Confident that I was of the allotted weight limit, I checked it again. It was too hot to put on any more layers and I didn’t want to throw anything out. Hmmm. There were rocks I took from the top of Kilimanjaro that I could probably toss. But then I thought about it and just decided to squeeze the rocks into the nooks of my carry-on. I took the travel pillow out of my carry-on and would just carry it around. That made more room for a pair of pants and another hefty book. I checked the weight again. My only concern now were the rocks. Some of them were flat with pretty sharp edges. It could be considered as a weapon for sure! Anyways, I made my way through check-in and went to passport security. I didn’t mention this before, but in order for me to volunteer in Tanzania I had to apply for a resident work permit. It was expensive, but it also granted me residency in Arusha. It was also required in order to volunteer. The clerk at the passport security told me my residency expired. I told him that can’t be right, because it lasts for three months. And in all honesty, I didn’t care if it did expire, I was leaving anyways and my permanent home is in the U.S. 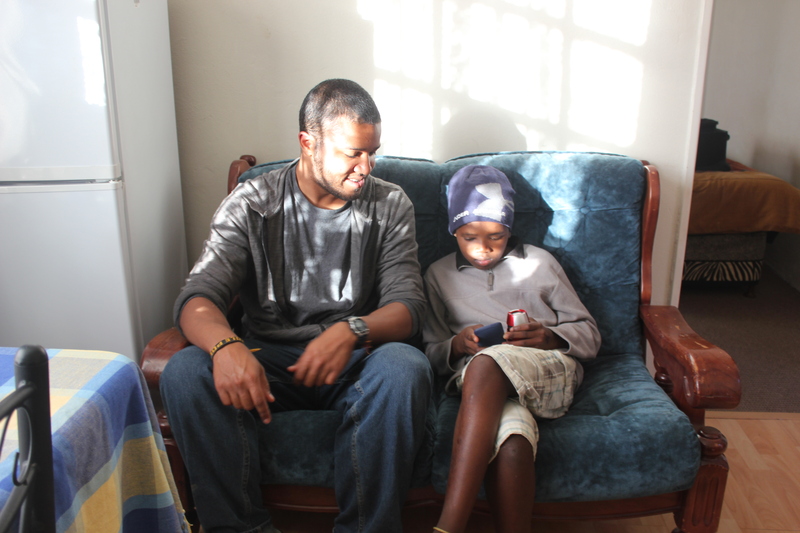 He gave me a hard time about it so I had to convince him that it doesn’t matter anyways because I’m leaving Tanzania! I love Africa airports. He finally let me through and now all I had to do was get through one more security check. My carry-on had to go through screening. My carry-on that now contained razor-sharp rocks! Before going though, I thought whether I should tell them first or let them find out for themselves. What if they saw it and immediately whisked me off to some Tanzanian jail thinking I was some sort of terrorist concealing weapons? I knew there was no way the airports in the States would let me carry these stones. But this is Africa and things are “different” here. I took my chances and didn’t say anything. If they said something, I would just throw them away. They didn’t say anything! The guy at the computer wasn’t even looking at the screen. Instead he was chatting away with another guy. I saw his screen and saw my razor rocks smack dab in my bag pocket. I got my things and went off. Kinda unsettling knowing that I could have had anything concealed in there and they wouldn’t even pay attention to it. 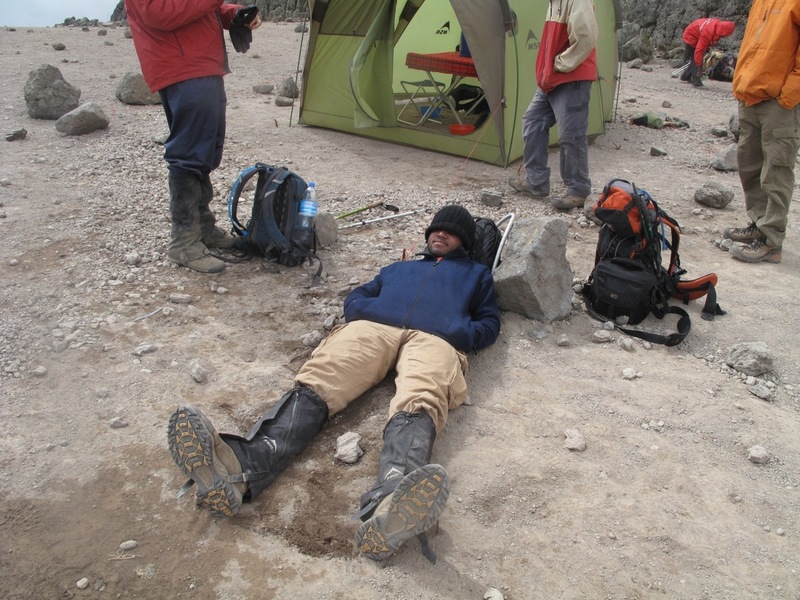 But at least I had my Kili rocks! Summit Day a.k.a the WORST day of my life. Also the best, but mostly the worst. That will make more sense later. So we woke up at 11pm in the bitter cold (mind you temperatures are below freezing) to eat a quick breakfast before the final ascent. For some reason, I had ZERO appetite and that is not a good thing. Having no appetite is an indicator for altitude sickness. I forced myself to eat two orange slices, but that’s about all I could muster. The others in my group told me to eat as much as I could, but I just didn’t want to. They barely had an appetite as well. I was viciously sleepy. I could have slept where I stood and I think I did a few times. Nderingo summoned our group to get into a line. Allison was first in line. 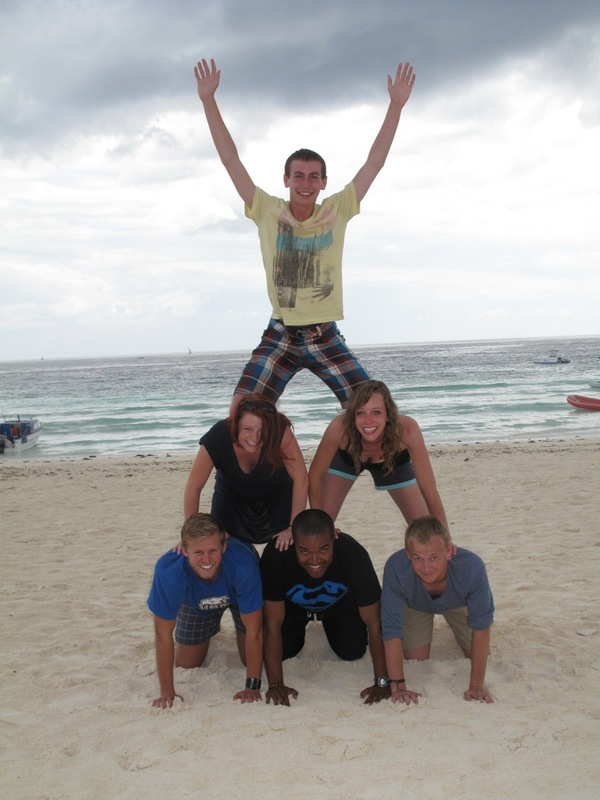 I was second, Mike was third, Kang fourth, Lana fifth, and Nick was the anchor. And up we went on the snow patched slope towards the summit. It was pitch dark. All we had were our head torches to see in front of us. We went extremely slow. Pole pole. I needed to. I don’t know what happened to me. Yesterday I felt golden, but now I feel like the start of something terrible. My sleepiness opened up the door to altitude sickness. I kid you not, half of me slept walked up the mountain. We would stop every ten minutes to take a quick two-minute break which I needed badly. And when I say quick, I mean quick. If we rested too long, we would fall asleep and freeze to death. Whenever I stopped for more than a minute, my toes and fingers would grow numb. It happened where I would instantly fall into slumber after pausing momentarily. That’s how insanely tired I was. The lack of oxygen and sunlight didn’t help my case either. The guides tried to give me sugar and chocolates to boost my energy. They literally forced it into my mouth. I had no choice. The others in my group told me no matter what, not to fall asleep. This was torture and I still had so far to go. That’s when I decided, either I jump off this mountain or I separate from my party. No offense to LX6, my forever mountain family, but I’m gonna do this alone. With little disturbance as possible. The songs were like lullabies and were drowning my eyes even more than what they were. So at the next rest, I went off to find a place to go number 2. I told the rest of my group to go ahead without me; I could take a while. It was the perfect diversion. It was also the coldest poo of my life! 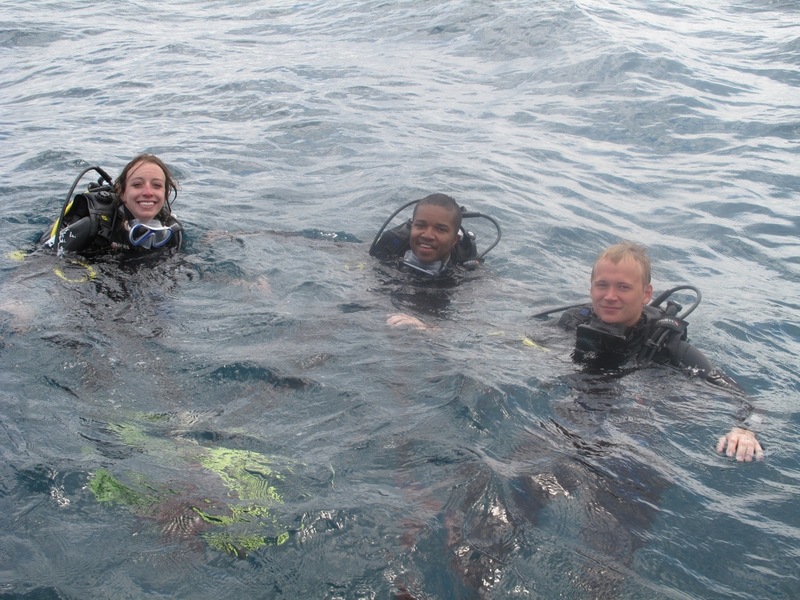 Two of the guides stayed behind with me to make sure I stayed alive. I don’t remember a lot of the night hike because I was sleeping every few minutes. All I could see was that I still had ways to go. I saw my group far ahead; their head torches glistening like stars in the sky. I’ll admit, I stopped a lot. It was so hard to breathe up there. In addition to my breathlessness, my coughs came back a vengeance. The end of each death cough felt like I was going to vomit. My headache grew worse, but it was nothing a little aspirin couldn’t fix. The cold was the least of my worries. The sickness that I had increased ten-fold. I just wanted to sleep for five minutes. Finally, after hours of zombie-like trekking, the sunlight cracked open the dark starry sky. A sea of light rose from the snowy clouds. I saw blue skies in front of me. And like magic, my drowsiness wore off. I was still exhausted, but I didn’t feel the need to sleep anymore. However, it was difficult to catch my breath. After every few steps I wanted to lay on the ground and relax to catch air. By this time, my camel-pack has frozen over. I couldn’t drink any water because the hose was frozen solid. No water for this guy! My camel-pack even had insulation covering it, but it was useless. I even did the trick: blow back the water after every time you take a sip so it doesn’t freeze in the hose. I was in such a trance that I forgot to do that a couple of times. The guides told me once I get to Stella Point (the point before the summit) its smooth sailing from there. They said it was a straight path to the peak. This was extremely encouraging as the last part before getting to Stella was the steepest. The guides literally had to push me up because I was sinking in the gravel with each step. But finally, I made it to the point and joined my comrades who were resting there. I fell to the ground and felt like I could have died right on the spot. They seemed to have an easier time than I did. That’s the thing about the altitude, it doesn’t matter how great of shape you are in, it effects everyone differently. I knew for certain now at this point, the altitude hates me. She hated me in Peru, she hated me even more on this mountain. I laid on the ground and saw my group look as if they wanted to pass out too. 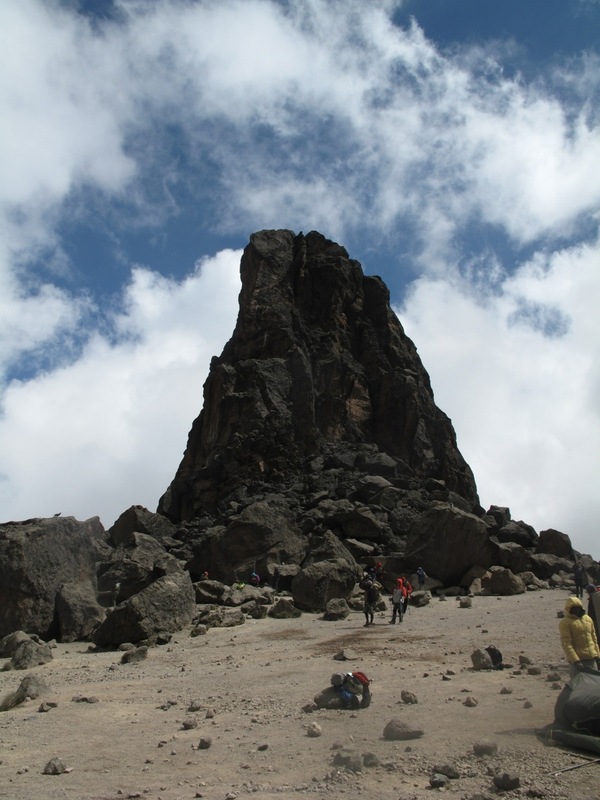 Nderingo pointed to the summit of the mountain, Uhuru Peak. The guides lied to me. They told me it was smooth sailing from here. It turns out I have to ascend more but this time through an icy crevice to reach the peak. I motioned for my group to go ahead of me. My guides suggested I go with them but I wanted to rest a bit more before my last trudge up to summit. I caught my breath, stood up like it was my first time standing on my own again, and slugged away. 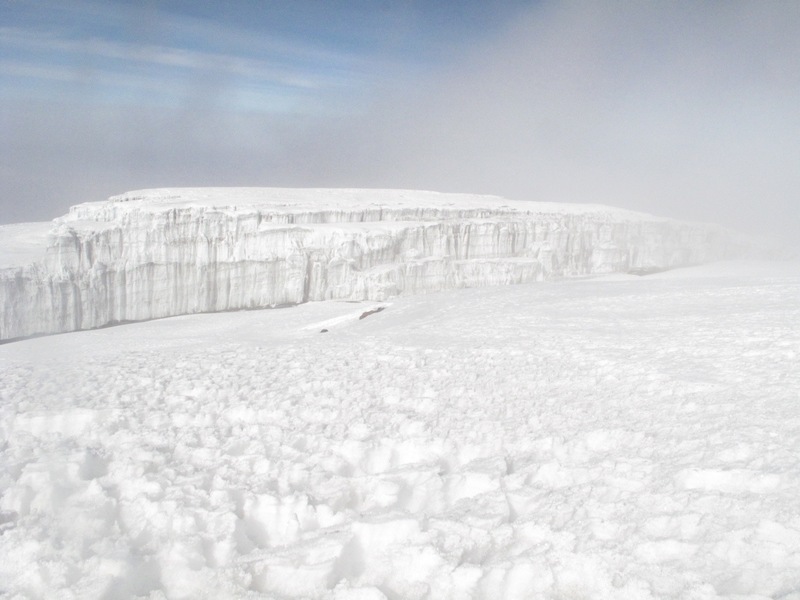 This is what the top of Kilimanjaro looks like. 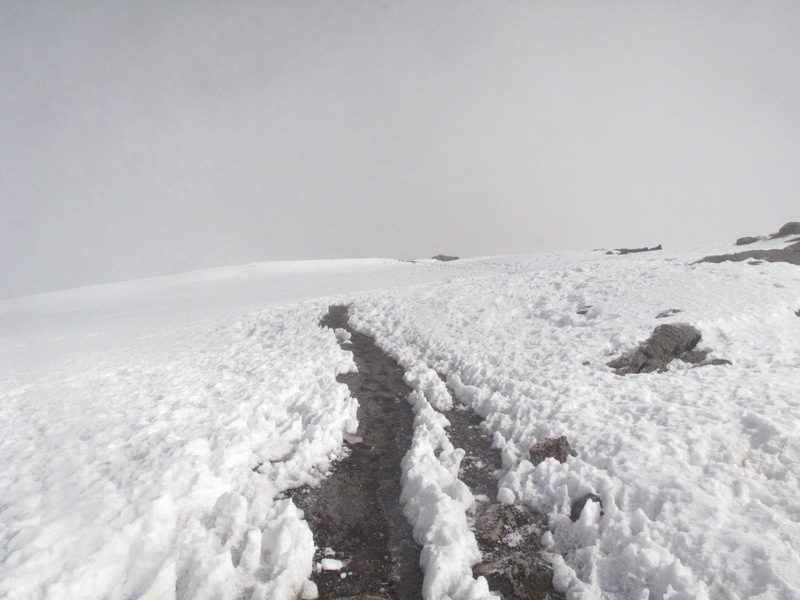 I saw other trekkers coming from summit with a happy smile on their face. They glanced at me and asked if I was okay. I guess I looked pretty pitiful haha! “You’re almost there! Just a little bit further.” One of the guides told me to put on my sunglasses. I told him no. “You will get snow blindness!” he said. I’ve read about snow blindness before coming up here. Apparently the sunlight gleans off the pure white snow more so at this high elevation which can cause a nasty glare to the unprotected eye. I was too focused on trying to breathe than to worry about snow blindness, but he insisted that I just put them on. I then let him in on a secret of mine. Sunglasses make me motion sick. I know it’s strange. Don’t ask me how or why but they do. I put them on anyways to please them. As I was hiking, I stopped and just about collapsed on the ground. My energy left me and I was struggling for air. I remember the day before the hike when the guides went over safety precautions and showed us an oxygen tank they will bringing for emergencies. I remember thinking to myself that I won’t be the one needing it. Oh how I wish that was true! They whipped the oxygen tank out of their backpack and strapped it to my face. After a couple of minutes, they asked if I was okay. I felt the same. I’m not sure if the oxygen helped, but I felt like it did nothing. I nodded my head anyways because I was starting to become worried that they were going to make me stop if I said no. So I slugged along. I’ve never felt worse in my life. I threw off my hat. Tossed my sunglasses. Stripped off my scarf and dropped my walking poles at my feet. 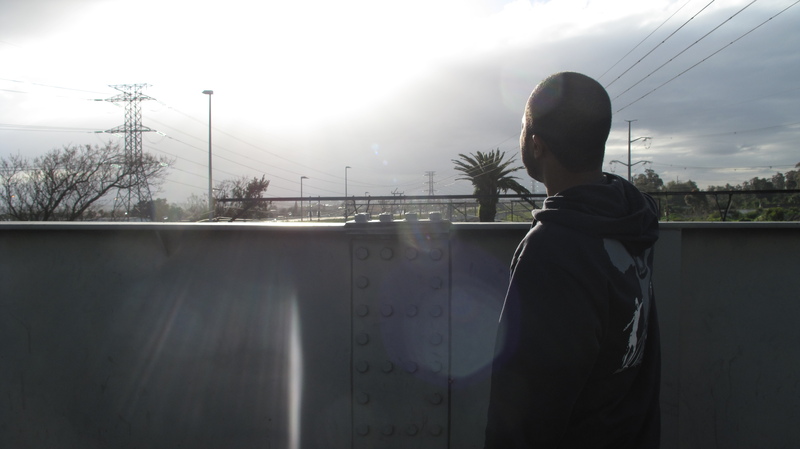 All of my ill fated symptoms, headaches, coughing, breathlessness…everything went away. I wasn’t even cold. I was fully conscience. I could of cried. Everyone else certainly did. This was by far the hardest thing I have EVER done in my life. I’ve never felt this level of accomplishment before…ever! I was in a state of euphoria. All of this hard work paid off. 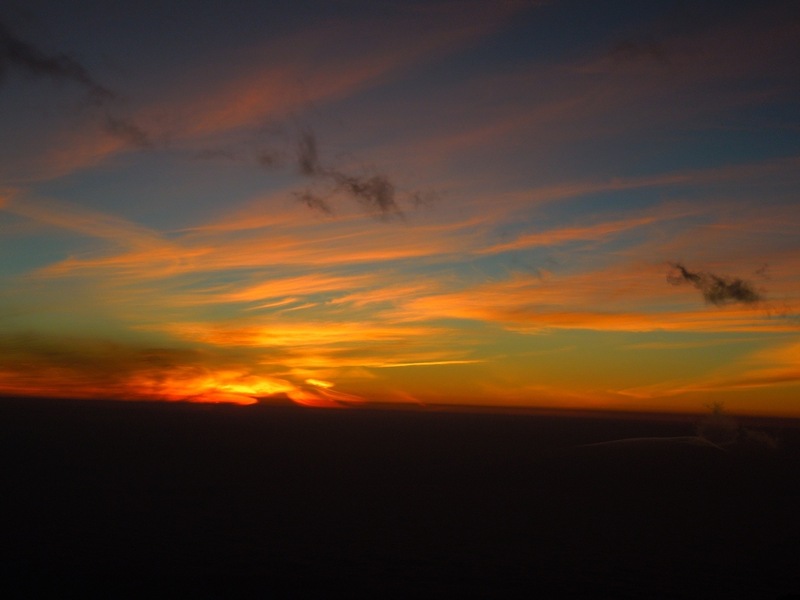 I was standing over 19,300 feet in the sky and it was the most amazing feeling in the world. 9:20am is the time I clocked in. I was overwhelmed in relief and excitement. It’s hard to explain in words the feeling you get from this. I can be honest with you. As much as death grabbed me by the legs the entire summit day, not once was I even thinking about giving up. Not even a little. 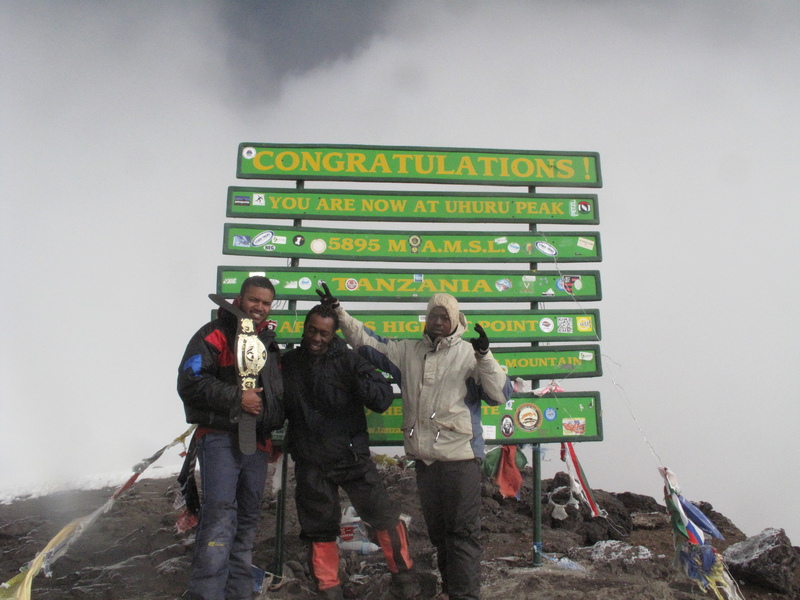 I knew from the get-go that I would make the summit, no matter how long it took me or how hard it was. That small ounce of determination is what I needed to keep me alive and sane. There was no way I could live this down. 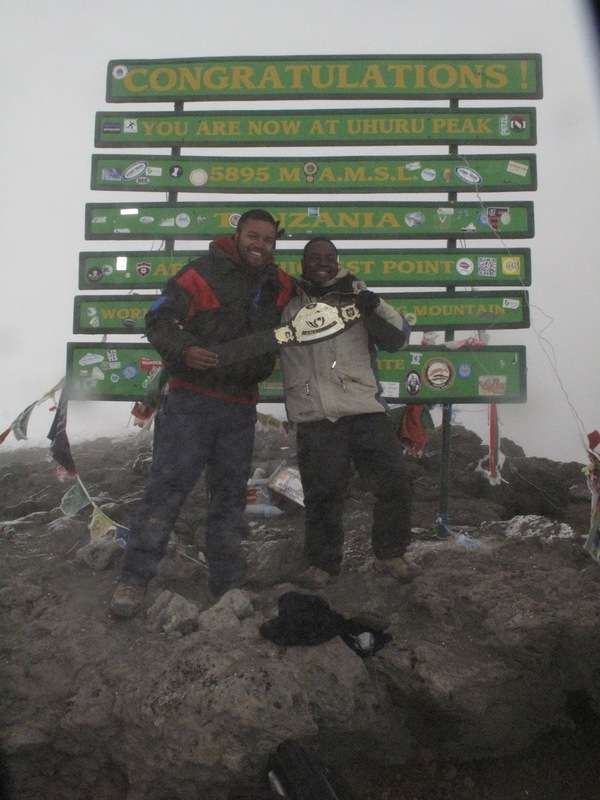 I literally felt like I was going to die where I stood, but my strive to get to the top was the stronger force in motion. I never looked back. I never gave in. I came way too far to turn around without any consolation. With that, through all the odds, I found sweet success. 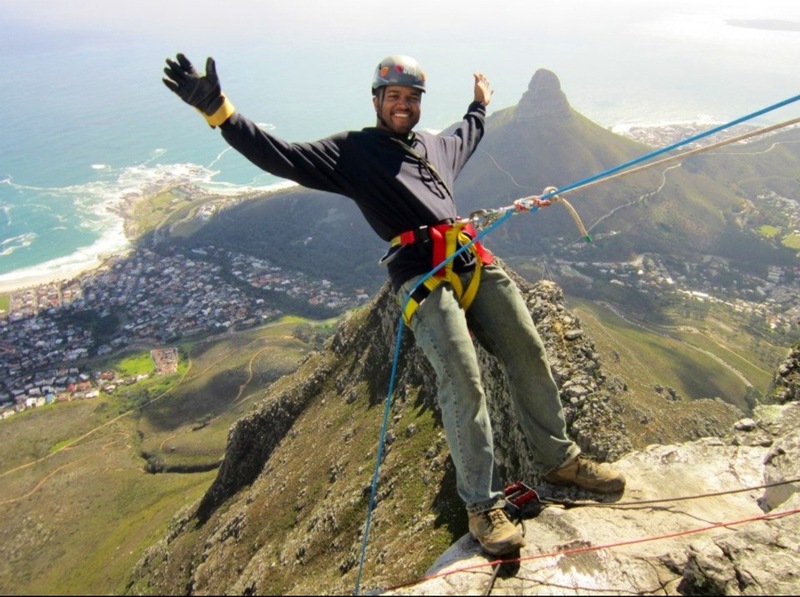 My sickness before climbing definitely played a part into my struggle. Even if you have the slightest cough I do not recommend you do this. I learned the hard way. Now time to get the f*%* off this mountain! The doctor didn’t answer me immediately. He instead checked my heart rate and prescribed me with a bunch of meds. “If you take these, you should be okay by then” he said. 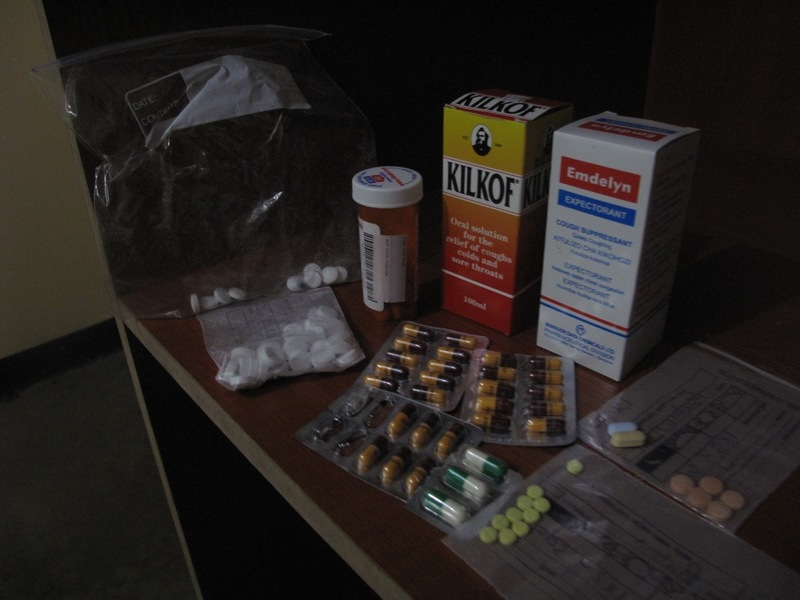 It was friday, which meant I needed these drugs to work by Sunday in order to be in good shape for the tallest free-standing mountain in the world. What a long shot! It’s so much! I’m very naive when it comes to this stuff. I feel like a pill popper. Will I die from taking all of these drugs at once? I don’t even know what those yellow tablets are for. In addition to the malaria pills that I have been taking once every day, now I have to take all of these at least once or a few times per day. But I felt like I had to do whatever was necessary to feel better. With that, I made my decision that I was going to climb. So I told Lana (Vancouver, Canada), another volunteer in charge of organizing a team of trekkers, “I’m in”. I would regret it if I didn’t at least try. 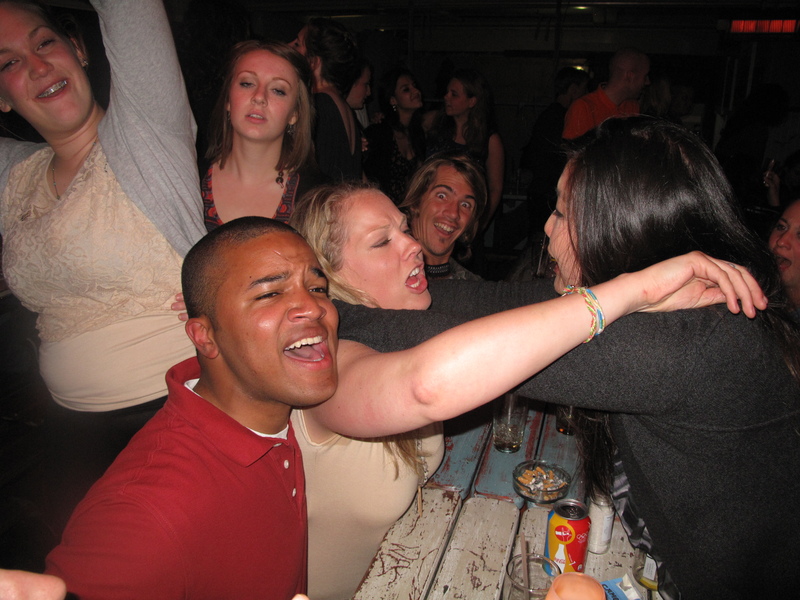 However, if I didn’t make it to the peak, then it would be one of my more embarrassing moments. 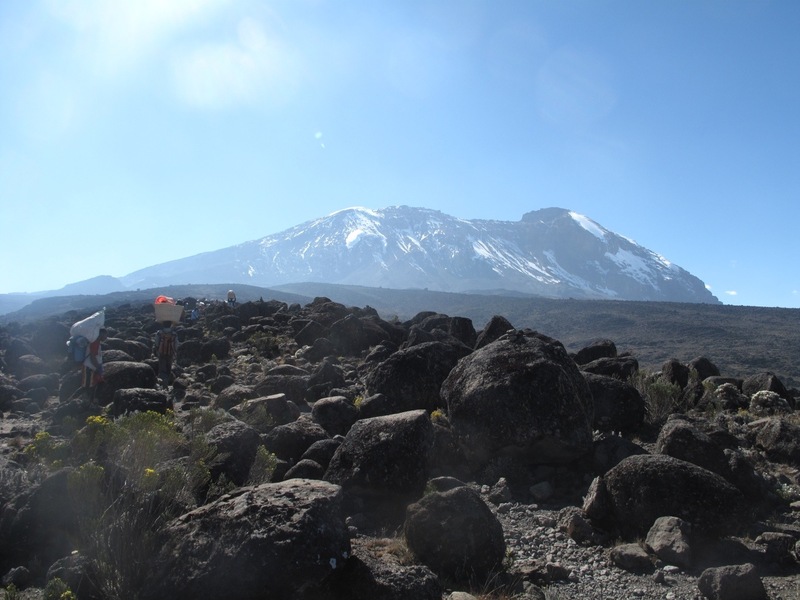 For the next few blog posts, I’m going to treat my experience on Kili as sort of a rough guide for any of you readers out there in the world who are interested in summiting this gargantuan beast. I’ll share what to do and what not to do. My first-hand experience. There are six of us making the journey to the summit: Myself, Lana, Mike, Nick (London, UK), Allison (Chicago, US) and Kang (China). We are team LX6! LX6 stands for “Lana times 6. We were picked up from Arusha and taken to Moshi in the morning. LX6 at the hostel before the hike. Being the chocolate fiend that I am, I ate two of the Snicker bars before the hike even began :). 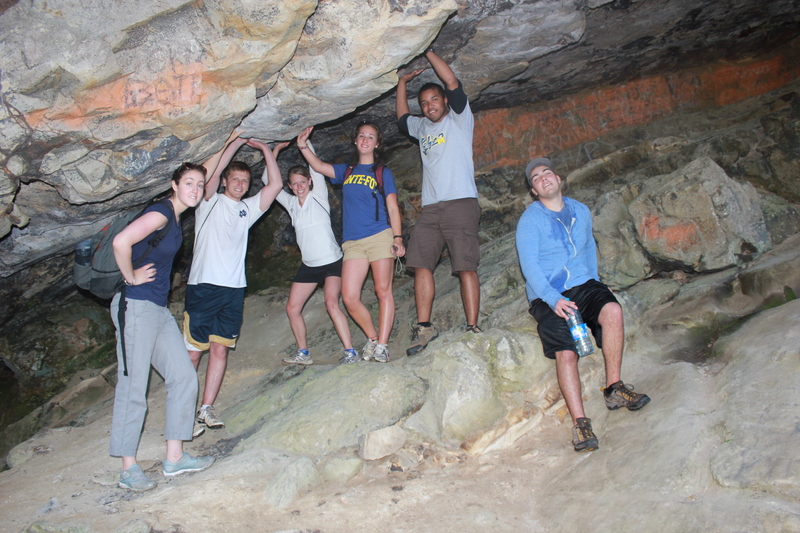 I will tell you first hand though, pausing to eat a Snickers after hours of hiking is the best thing in the world! I never had a Snickers bar that tasted so good. I would advise against getting cashews or peanuts. They dried my mouth out and I didn’t get the glucose energy I needed from them like I got from the chocolates. We were taken to our hostel for the night where we were given a brief lecture about important things we should know about our hike. 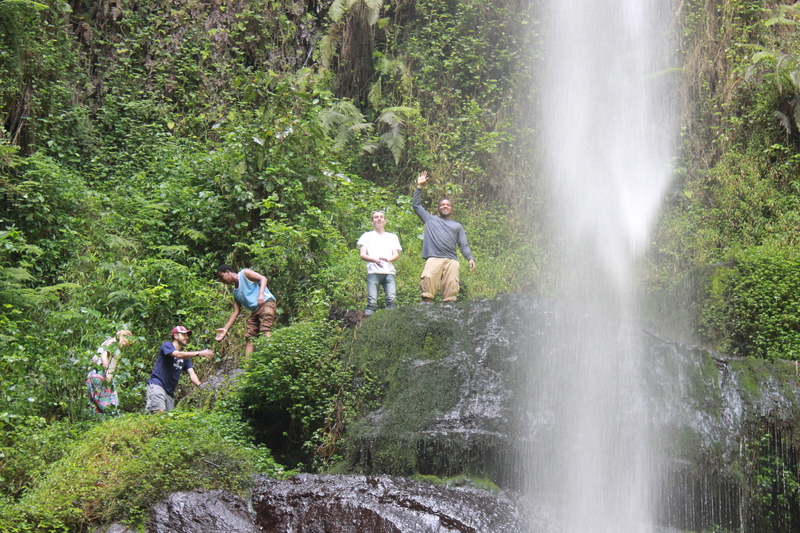 We met our three guides there: Nderingo (the chief guide), Peter (assistant guide), and Sosteness (assistant guide). We would wake up in the morning the next day to start our ascent up the Machame Route, the second hardest ascent to the summit of Kili. 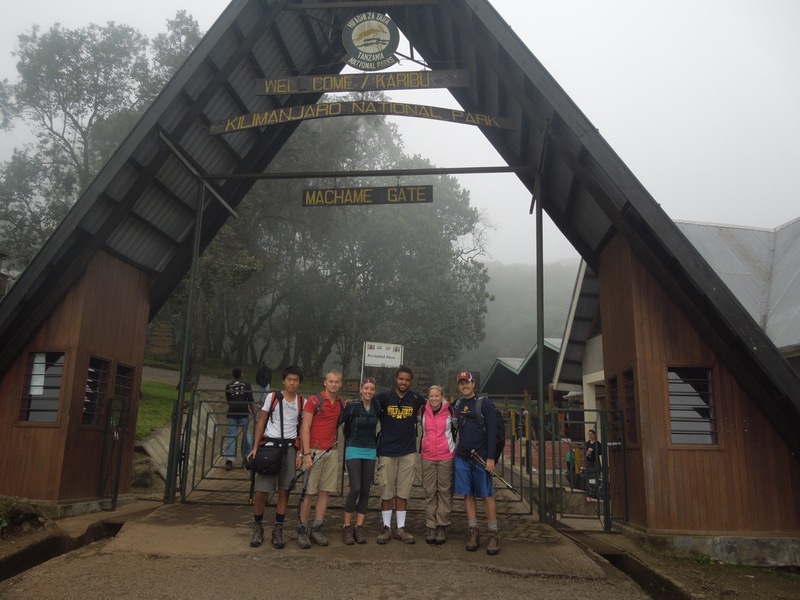 At the start of the Machame Route. 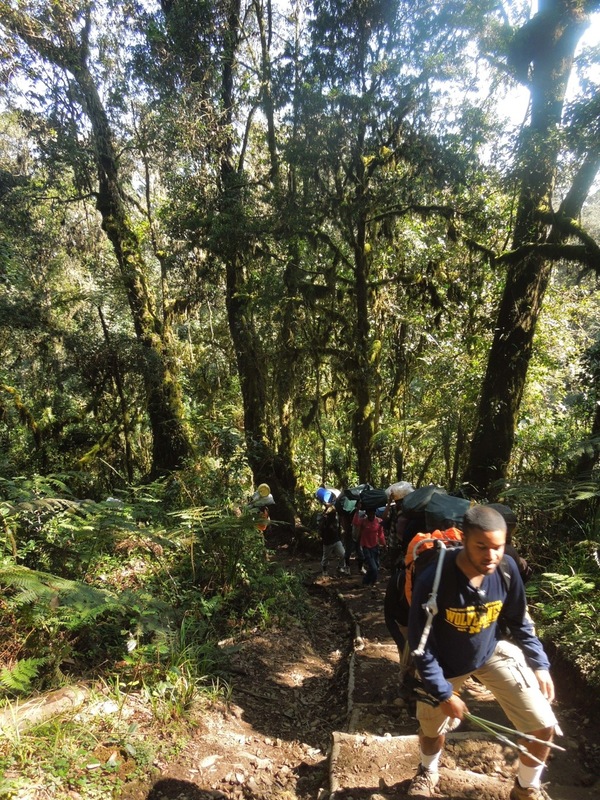 The hike on the first day was through a humid, muddy jungle. Trees were draped with vines and covered with bright green moss. Flys and mosquitoes were everywhere! It was a sweat fest for sure. I was certain I’d see Tarzan swinging around on these vines at some point. It’s highly recommended that climbers hike very, very slowly to let their body acclimate properly to the increasing altitude. And that’s exactly what I did. I had the pace of a grandma crossing the street. The guides would shout “pole pole!” which is Swahili for “slowly slowly!” So this would be my first tip for you: Take it slow! Statistics show that young males are the least likely to summit because they go too fast. I would have been part of that statistic if I had not read about how important it is to go pole pole. It was a bit frustrating at first going such a snail pace because I could have gone much faster. But I knew from past experience what altitude sickness felt like and I didn’t want to succumb to it again. The slower I went, the less oxygen I used which meant my body could use more oxygen to acclimate properly. On top of that, I was still sick so I didn’t want to take any chances. 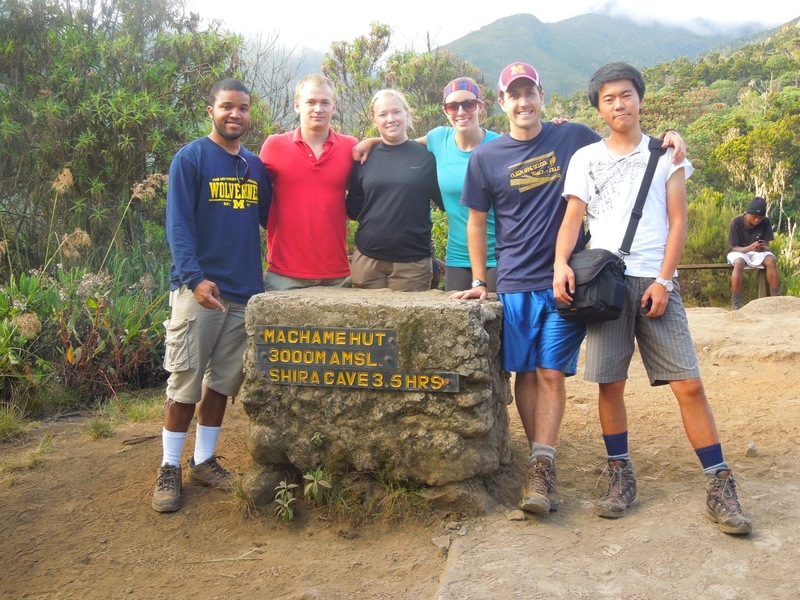 After about 6 hours of hiking, we made it to the site of our first campsite at the Machame Huts (9911ft). 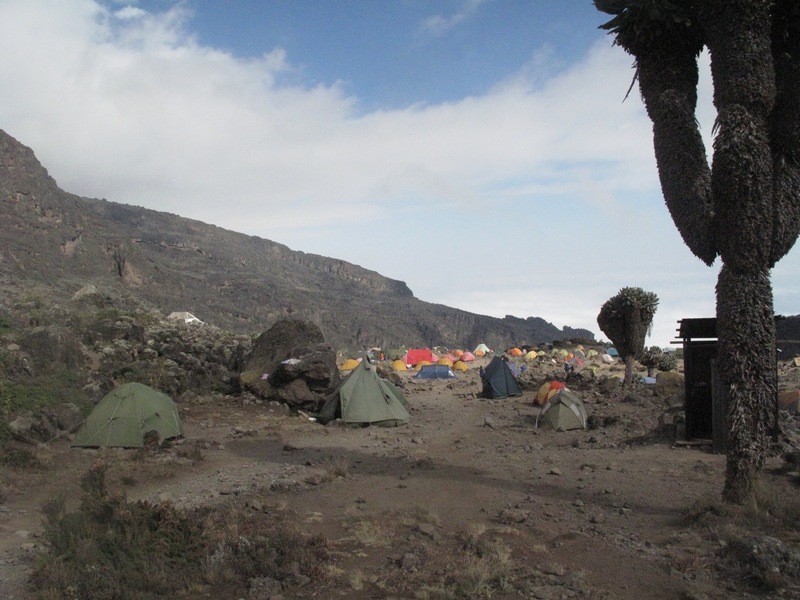 Our guides set up three tents, two trekkers per tent. The tents were very small but they did the job. Everyday the cook in our team would make us breakfast, lunch, and dinner. All hot meals! Breakfast is usually porridge or oatmeal with a rotation of juices, sausage, eggs, crepes, and fruits. Lunch and dinner is where we would get soups, chips, pastas, rice, salads, fruits, and other side options. Lana, who is vegetarian, was given specially prepared meals just for her. Much to my surprise, we were very well fed the entire time on the mountain. There was also plenty to go around. The cook did an amazing job. 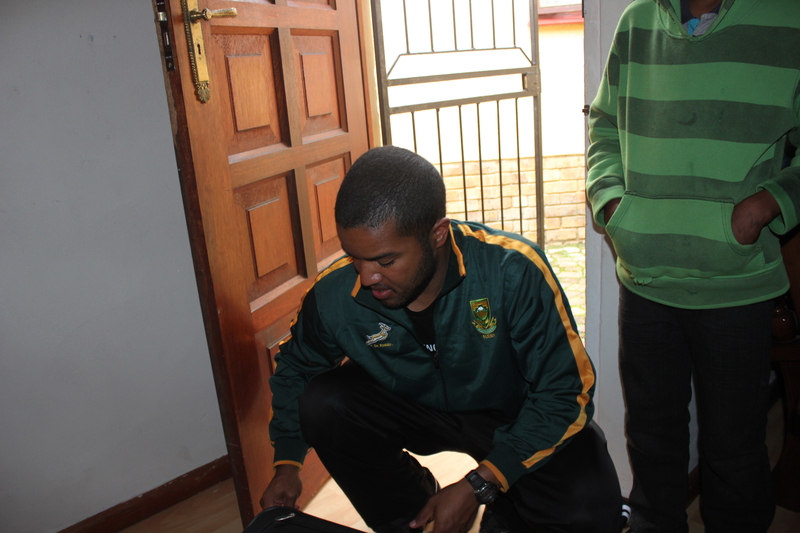 We even had our own personal waiter each day who brought us anything we needed. Such a nice touch :). The next day we made the ascent up to our next stop, the Shira Caves (12,595ft). The terrain was different from yesterday. It was dusty and there were small shrubs all over the place. The day was a bit cooler and there were hardly any bugs. Even though the path was considerably steeper than yesterday, I found this trail to be a bit easier and more enjoyable. I kept the “pole pole” pace going. In addition to going slow my next big tip: Drink Plenty of Water! I cannot emphasize that enough. The suggested amount of water a climber should drink each day is about four to five liters. Every few minutes I would drink a sip of water from my camel-pack. In other words, I was constantly drinking water all day long. It keeps you hydrated and is an important source of oxygen for your body. Every time I urinated (which was quite often), I made sure my pee was crystal clear. Eventually we made it to the site of our camping grounds for the night. Although we made it to camp, our hike for the day wasn’t over. Our guides suggested that we ascend about a half hour further and then descend back down to camp. This brings me to my next tip: Climb High, Sleep Low. Basically by going up and then coming back down, you are preparing your body for what lies ahead. Tomorrow is Day 3. Previous hikers told me that Day 3 is the day when most start to feel symptoms of altitude sickness. Better prepare myself, off to bed I go! P.S. My coughs haven’t gone away yet. At this point, I ran out of cough syrup and I finished my antibiotics. I’m at a stale mate. Ok, Day 3. I heard this is one of the longer days of the hike. And it is. Today looked like we were hiking on a distant rocky planet. Dull colored and strewn with boulders and a tad brisk. It was a steady hike up a long slope and down through valleys. After hours upon hours of hiking, we ultimately didn’t ascend as much as we did the previous two days. Most trekkers hate this day because it is so long and dusty. It certainly was both of those. I didn’t get any symptoms of the altitude though. No headaches, no nausea. Nderingo said it was normal if I should feel these symptoms and they should disappear after descending a bit. I was completely fine. Just tired. Sleepy tired. I just wanted to find a nice boulder, sprawl out, and fall asleep next to it. I managed to sneak in a quick ten minute nap during lunch break. It didn’t last long. I had to continue the long hike towards the Karanga Valley Campsite(13,235ft). 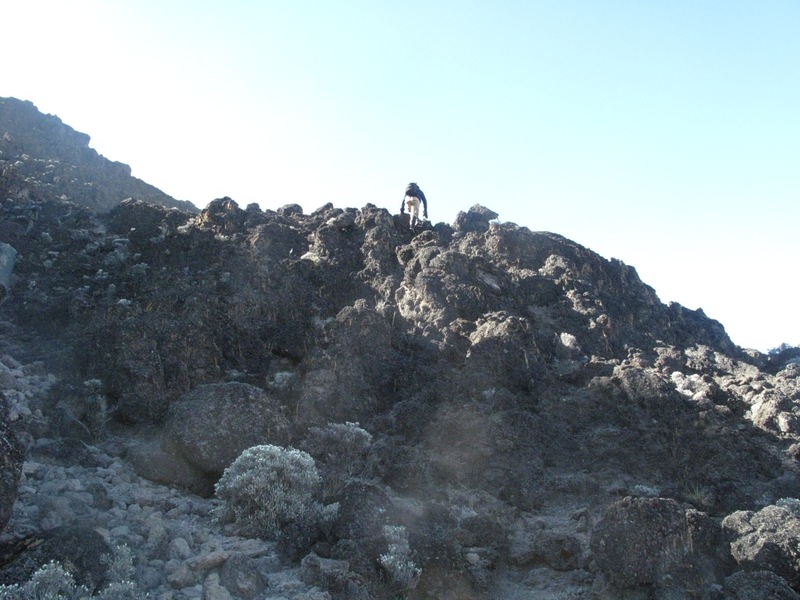 Before that we reached the Lava Tower(15,180ft), rested and had to descend down to Karanga. Today overall, was more about acclimating rather than ascending. We constantly went up and down and up and down. So far so good. Today was definitely my favorite day of the hike. Why? Because the terrain today was very rocky and the path wasn’t as laid out as previous days. I find I fare better with rocky conditions. I consider myself a pretty good rock climber and loved scaling the stone walls up the mountain. It was quicker than following the narrow path which took ages. This is the only time I broke my “pole pole” rule. I was fine though. I had fun doing it. I felt like Spiderman. I don’t know why anyone else wasn’t doing it too, but climbing the walls was very exciting. Maybe a little dangerous but I knew what I was doing. The guides let me climb because they saw how comfortable I was doing that, rather than walking along the set path. Very cool! There are two other useful pieces of information you should know. I completely forgot to mention that I had “anti-altitude” sickness pills with me called Diamox. Every morning during breakfast and at lunch I would take half a pill. What this does is acidifies your blood, allowing you to breath more conditionally and enters more oxygen into your bloodstream. I have no idea if it worked for me or not. I have nothing to compare it to. But it didn’t hurt to have these. They may have helped. 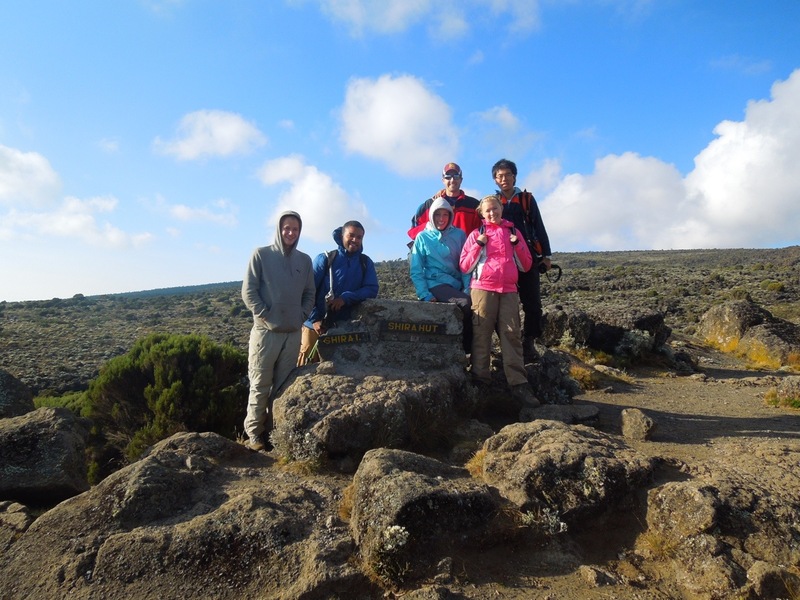 It’s highly recommended by everyone who has been on the hike up Kili. Another useful piece of information is to make sure you fart and burp, a lot! Passing gas and burping is a great indication that your body is acclimating properly. So don’t be afraid to let loose on the mountain. Myself and the others in my group had no shame. “Whoops sorry guys, just acclimating!” We would even applaud someone when they let out a giant fart haha! Never have we been more open about our gases, keeping count of how many times we cut the cheese. It’s something we can only do on this mountain. No shame. Just acclimating :). Today was a lot longer than the other days but I enjoyed today the most. 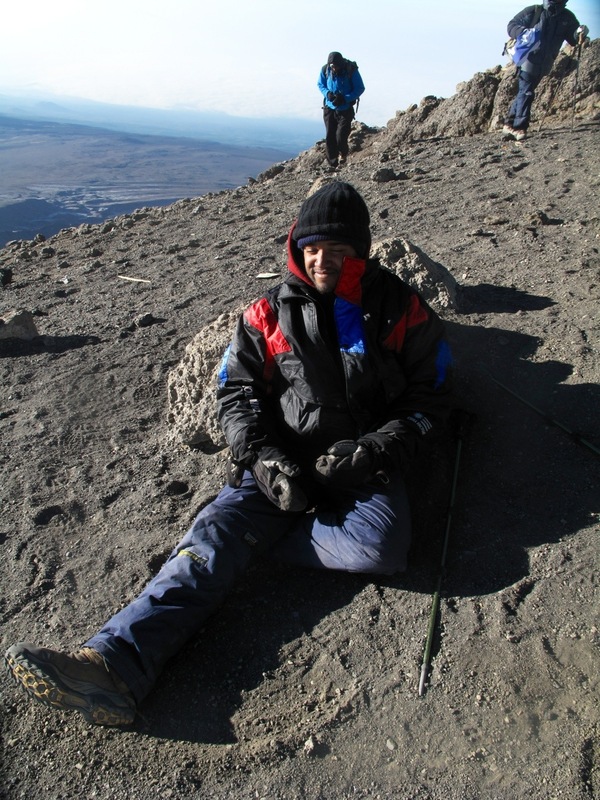 We finally made it to our last campsite for the ascent, the Barafu Huts(15,295ft).